Israeli soldiers invaded, on Wednesday at dawn, Palestinian communities in the West Bank districts of Bethlehem, Tubas and Hebron, searched many homes, and abducted five Palestinians, in addition to confiscating a tractor and a car. The Bethlehem office of the Palestinian Prisoners’ Society (PPS) said the soldiers invaded Bethlehem, and nearby Beit Jala city, and violently searched many homes, while interrogating various Palestinians. The soldiers also invaded Hindaza Mountain area, in Bethlehem, and searched the family home of Awwad Mousa Awwad, who was killed by the Israeli army in Bethlehem, in 2002. The violent search caused excessive damage, especially after the soldiers broke many doors. It added that the soldiers abducted Mohammad Jamal al-‘Azza, 20, from the Saff Street area, in Bethlehem, and Wael Jamal Khatib, 23, from al-Jadawel neighborhood, in Beit Jala. On Wednesday morning, the soldiers abducted a young man, and confiscated a Palestinian agricultural tractor and a car, in Khirbit Ebzeeq village, east of Tubas, in central West Bank. The abducted Palestinian has been identified as Mahmoud Hroub, while the confiscated tractor is owned by Mohammad Nasrallah Hroub, and the car is owned by Hayel Turkman. 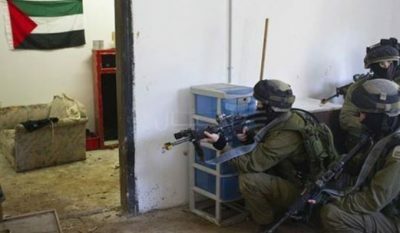 Furthermore, the soldiers invaded and violently searched homes in Beit Ummar town, north of the southern West Bank district of Hebron, and abducted one Palestinian, a former political prisoner, identified as Mohammad Khalil Abu Dayya, 28, from his work at a chicken farm in the town. The soldiers took Mohammad to his home, and searched it, in addition to searching the home of his brother, Hatem, allegedly looking for their third brother, Ibrahim, to abduct him. The soldiers also invaded the home of Sa’adi Ekhlayyel, looking for a Palestinian from the same extended family. Furthermore, the soldiers invaded several neighborhoods in Hebron city, and Taffouh town, west of Hebron. Also Wednesday, Israeli soldiers fired several artillery shells, and live rounds, into an area, east of Rafah, in the southern part of the Gaza Strip, killing a Palestinian teenager, identified as Yousef Sha’ban Abu ‘Athra, 18, and wounding two others. The soldiers also invaded Palestinian lands in Rafah, and bulldozed them amidst sporadic gunfire, while war jets hovered over various areas on the besieged coastal region. On Tuesday evening, several fanatic Israeli colonists attacked Palestinians and cars, on the main road linking between Nablus and Jenin, in the northern part of the West Bank. The colonists also chased Palestinian shepherds, and fired several live rounds, near Borqa village, north of Nablus.